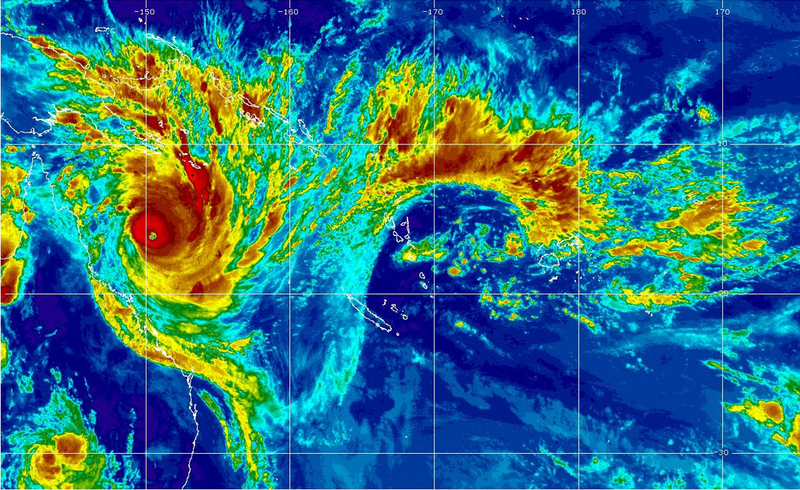 This post will have the original story about this huge Cyclone Yasi part way down the Post here, and the most recent UPDATES will be at the top of the post. All links to the most recent news articles will be at the top of the UPDATE. Related Posts will be at the bottom of the Post. All images shown at this Post will open on a new and larger page if you click on them. Cyclone Yasi is now a tropical rain depression, and has moved across the State, almost to the border of the Northern Territory. The following is the most recent weather map image from the Bureau of Meteorology, showing this huge Tropical Low Pressure System and the accompanying rain associated with it. All Tropical Cyclone advisory notices have been cancelled. As emergency services people move into the affected areas on the coast where the Cyclone made its first impact, scenes of devastation are becoming apparent. What is of most concern is the damage to the Banana crops and also to Sugar Cane crops. This area most impacted supplies 90% of Australia’s Bananas, and images of crops of thousands of trees neatly snapped off at around the two foot mark are everywhere to be seen. Bananas now lie on the ground in their tens of thousands among the fronds from those trees. Sugar Cane crops have been flattened almost to the ground. Compounding the damage caused by the huge winds, flooding is now setting in along the Rivers in the affected areas as the immense rain dump associated with the Cyclone fills those Rivers beyond the banks. The electrical power supply to the area has been cut, and some consumers may be without power for anything up to months, as infrastructure will need to be rebuilt, power poles slammed to the ground, along with huge trees. In the link to the image galleries below, there is an image of Port Hinchinbrook, where there is a relatively sheltered Marina holding hundreds of yachts and pleasure cruiser. All of them were torn from their moorings and slammed onto the shoreline during the height of the wind and the huge sea surge. This may be an awful thing to see, but for me the abiding image is one of flattened banana crops There are a lot of links below here that I have added, and if you do take some of them, then the videos of the damage to those crops and the image galleries showing that damage are ones that are the most graphic of all. Image by Jamie Hanson. Click on the image to open in a new and larger window. ABC News: This link takes you to a short image gallery of some of the damage caused by the fury of the Cyclone. ABC News: PM inspects cyclone ravaged North Qld. This is the most recent article.It has 15 separate links to video news articles from the area of devastation. It’s worthwhile taking some time to view some of the videos because they give an excellent overview of the damage, cause to the banana crops and the sugar cane crops. The Courier Mail Home Page: This page has numerous articles associated with the Cyclone. The Courier Mail: This link takes you to a special interactive feature. As you can see, there is a menu bar across the top of the Home Page. Each tab takes you to a different area and once there you can navigate around through videos, image galleries, satellite images and comparisons to other major Cyclones and Tropical Storms. The Courier Mail: This is a link to an image gallery of nearly 100 images of the storm and its aftermath. The Courier Mail: Long road to recovery lies ahead for communities after Cyclone Yasi. The image at the top of this article is a short video, and as you can see there is a second tab above the image to a second video, and there is a third video part way down the page. The Courier Mail: Ex Cyclone Yasi fizzles but still dumping rain. This article has a video showing damage to the two major towns affected during the storm, Tully and Cardwell. News is gradually coming in of areas left devastated by the fury of Cyclone Yasi. Some small towns have been smashed by the Cyclone, mainly those directly in its path as it crossed the Coastline. Luckily, the main power transmission structures, those huge towers withstood the fierce winds. Having said that, power is still currently out for almost 200,000 consumers, and for some it may be a matter of weeks before it can be restored. Those towns worst hit are Cardwell, Tully, Mission Beach, Sikwood, and Port Hinchinbrook. The Cyclone has now been downgraded to Category One and is currently moving towards Mount Isa in the West of the State. As Emergency Services people are still trying to get to areas that were the worst affected, news is still coming in, and each story seems to be worse than the earlier ones. The one thing we can all be thankful for is that to this point, there have been no casualties. The links below tell the story better than I can. The live radio link has many calls from local residents who have been affected. Link to TV coverage. After taking the link, click on the ‘Watch Live’ button under the ABC News icon. This is the Australian ABC 24 hour News network, and they are running live coverage of the Cyclone with reports from all areas in the main impact area of the Cyclone. Link to latest Satellite imagery of Cyclone Yasi. This is an 8 image display of the current view of the Cyclone. It shows the Cyclone’s eye deteriorating as it moves South West. Link to live radio coverage of the Cyclone from the areas involved. This is ABC Queensland local radio also with reports from the area involved. The on air announcers regularly take calls from people in the area where the Cyclone has impacted. ABC News: Despair and Relief in Cyclone’s wake. This is the most recent article and has many links to video and audio from the areas of devastation. ABC News: Cyclone leaves lives in tatters. This article also has related articles, video, and audio and those further links are below that main image there on the page. The Courier Mail: Cairns evacuees returning home after Yasi. This has audio, related stories, and some video taken at the height of the Storm. The Courier Mail: Cardwell devastated by Cyclone Yasi. This article has related stories, an image gallery, and audio from the Cyclone scene. Bureau of Meteorology site: Cyclone Yasi Warning Advisory Notice. This is the most recent tracking for the Cyclone as at 2.12PM Thursday 03Feb2011, and it shows the projected path of the Cyclone, and all its details. Bureau of Meteorology site: This is the most recent Advice from the Bureau giving the details of the Cyclone. This is the most recent advice notice (Number 36) issued at 2.14PM Thursday and it has the main details close to the bottom of this Advisory Notice. Cyclone Yasi has carved a path of destruction through North Queensland during the night. The System has been downgraded to Category 2 with a central pressure of 983 HectoPascals and winds near the core still around 90MPH. The system is currently south east of Georgetown, around 180 miles inland from Innisfail. The fourth link below, the first ABC News link has the most recent news with many video and audio links. Early information is filtering in of scenes of devastation, especially at Tully, which is 15 miles from Mission beach, where the Cyclone crossed the coastline. Tully is a small to medium sized town of around 3500 people. Tully is renowned throughout Australia as the place with the highest rainfall in the country for a populated area. The average yearly rainfall is around, wait for it, 13 feet, and in 1950 it went into the record books as the place to have the highest yearly rainfall for a 12 month period, 7.9 metres, or 31 feet of rain, in one year. Early callers to morning radio from Tully talk of a night of sheer terror, and from just walking around town this morning, there are scenes of houses flattened, roofs gone, huge trees uprooted, and debris everywhere. The area is a large farming area for sugar cane and bananas, and crops have also been flattened and destroyed. The major population centre of Cairns seems to have escaped the worst of the devastation, and early reports from Innisfail tell that it also fared reasonably well. Some reports are just filtering in from Cardwell, 40 miles to the South of Mission beach, and on the water. of scenes of devastation there as well. 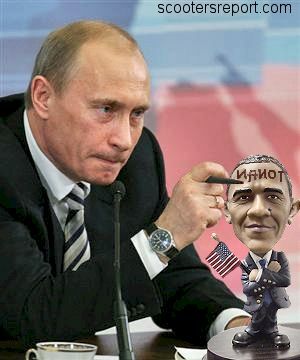 As I mentioned, it’s early days yet, as people are just starting to find out what really did happen during the night. ABC News: Monster storm smashes coastal towns. This is the most recent article and has many links to video and audio from the areas of devastation. The Courier Mail Home Page: This page has numerous articles associated with the Cyclone. 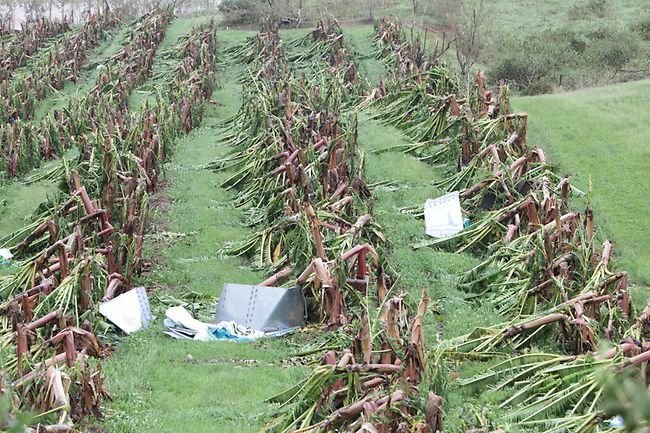 The current (early) main image shows flattened banana trees, with every tree snapped off at about the two foot mark. This crop would have close to 2000 trees, and the banana crop was close to being ready, now completely gone. The Courier Mail: Tropical Cyclone Yasi to leave ‘unprecedented’ destruction and heartache, says Anna Bligh. Again these are early reports. Anna Bligh is the Queensland State Premier. The Courier Mail: Cyclone Yasi leaves Tully a scene of devastation. THis article also details some of the scenes at Mission beach, where the Cyclone made landfall. Bureau of Meteorology site: Cyclone Yasi Warning Advisory Notice. This is the most recent tracking for the Cyclone as at 8AM Thursday 03Feb2011, and it shows the projected path of the Cyclone, and all its details. Bureau of Meteorology site: This is the most recent Advice from the Bureau giving the details of the Cyclone. This is the most recent advice notice from just before 8 AM with the main details close to the bottom of this Advisory Notice. Cyclone Yasi crossed the Queensland coastline at approximately midnight at a small town of Mission beach, just to the South of Innisfail. This image shows the eye of the Cyclone directly over Bingil Bay, which is where the town of Mission beach is located. 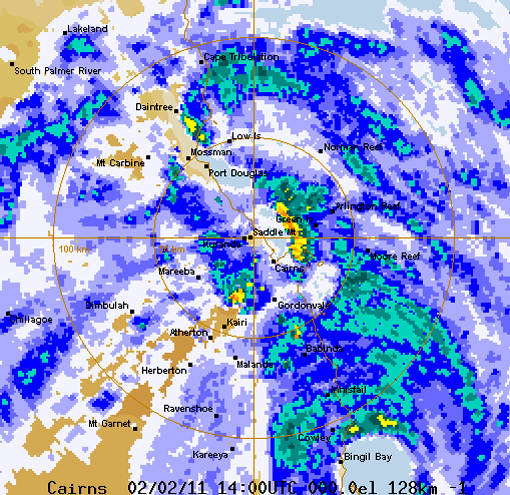 This image is from the Cairns Weather Radar set to 128KM. You can just make out Innisfail in the blue green area which indicates rainfall. Innisfail is around 20 miles North of Mission beach, and Cairns is around 65 miles North of Mission beach, and you can just make out Cairns near the yellow patch which indicates even heavier rain. No reports are coming in from any of the areas under threat at the moment. Evidently, power has gone out in some places in Cairns. Major storm surges as high as 9 metres (31 feet) have been reported as far South as Townsville. The State Premier in her most recent conference at around 11.30PM mentioned that there is some concern about the main high tension power transmission lines that carry electrical power to the North of the State. They may not be able to withstand the winds associated with this Cyclone, and those winds are in the vicinity of 290KPH, or around180MPH. So far, 89,000 homes are without electrical power. 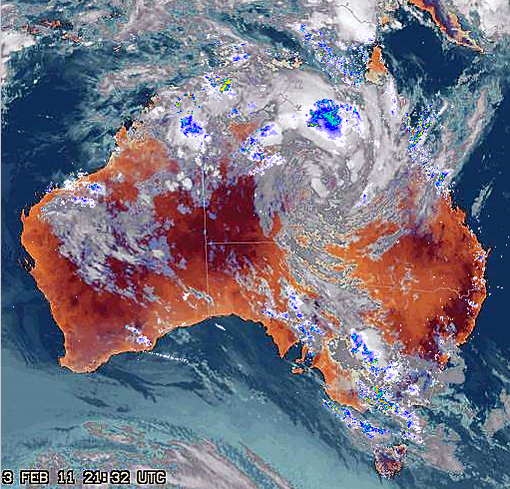 Link to latest Satellite imagery of Cyclone Yasi. This is an 8 image display of the current view of the Cyclone. As you can see from this imagery, the eye has just crossed the coastline. Link to live radio coverage of the Cyclone from the areas involved. This is ABC Queensland local radio also with reports from the area involved. ABC News: Queensland coast feeling Yasi’s fury. This article has related articles, video, and audio and those further links are below that main image there on the page. Bureau of Meteorology site: Cyclone Yasi Warning Advisory Notice. This is the most recent warning from 11.59PM Wednesday 02Feb2011, and it shows the projected path of the Cyclone, and all its details. Bureau of Meteorology site: This is the most recent Advice from the Bureau giving the details of the Cyclone. Early reports coming in from Innisfail tell of roofs being ripped off. One report from Magnetic Island off the coast of Townsville report extremely high winds and the beginnings of a sea surge. This image shows the Bureau of Meteorology map for Cairns set at 256 Km. It shows a distinctly defined Eye directly off shore from Innisfail which you can just make out under the coloured rain imagery. The latest advice (Number 21 at 2050) shows the Cyclone slowing down slightly to around 25KPH and 110 Kilometres due East of Innisfail, with a central pressure of 930 HectoPascals, and wind speeds near the core at 285 KPH, or around 180MPH. I now have a link to LIVE TV coverage of the Cyclone event, After taking the link, press the ‘Watch Live’ button under the ABC News 24 Icon . Cyclone Yasi now larger and more deadly dangerous than Katrina. Link to latest Satellite imagery of Cyclone Yasi. This is an 8 image display of the current view of the Cyclone. Link to live radio coverage of the Cyclone from the areas involved. ABC News: Cyclone towns ‘on their own for 24 hrs’. This article has related articles, video, and audio and those further links are below that main image there on the page. The Courier Mail Home Page: This page has numerous articles associated with the Cyclone, and an image overlaying this Cyclone across the U.S. showing its extent from the Gulf Of Mexico to the Canadian Border, and from the Eastern Seaboard almost across to California, covering virtually the whole of Continental U.S. This page has related stories as well. Bureau of Meteorology site: Cyclone Yasi Warning Advisory Notice. This is the most recent warning from 11PM Monday 01Feb2011, and it shows the projected path of the Cyclone, and all its details. The time for evacuation is over. Roads out of the North are choked with cars heading South. People are being told that they are now on their own until the Cyclone has passed, and that could be a day or two. They are being told to barricade themselves in their bathrooms with mattresses, doonas, etc, to fill their baths, have some food. They are being directed not to go outside at all. This Cyclone is now the most powerful to impact the Australian coastline. It is still scheduled to come ashore South of Cairns, in an area between Innisfail and Cardwell. Winds at the core of the Cyclone are expected to be in the vicinity of 320KPH, or around 200MPH. A storm surge in the affected area is expected to be in the vicinity of 9.5 metres, or around 31 feet. The impact time is expected to be between 10PM and Midnight local time, or 7AM to 9AM U.S. Eastern, or 4AM to 6AM U.S. Pacific Time. ABC News: Cyclone to bring 24 hours of terror. This article has related articles, video, and audio and those further links are below that main image there on the page. The Courier Mail: 30,000 evacuated from Cairns as a city braces for a pounding from Cyclone Yasi. THis article has been UPDATED since the earlier story was posted.. Tropical Cyclone Yasi was upgraded during the night to a sever Category 5 Storm. This image is taken from the latest satellite imagery for the Cyclone. You can make out the coastline of the State of Queensland in white at the left of the image, and the eye of the storm has become quite pronounced. This now puts it on the same scale as Hurricane Katrina. It is expected to impact the Queensland Coastline to the South of Cairns, a major city in the North with a population of 125,000 people. Many of the towns around this area have been evacuated as people flee what is being described as the greatest storm ever to impact Australia, at least in the modern era. Winds at the core are expected to be up around 300KPH, or nearly 200MPH. An accompanying huge sea surge is also expected to increase the effects of this disaster. Cyclones usually dissipate quite quickly once they make landfall, but a storm of this size will stay as a Cyclone for quite a while as it deteriorates, and that is expected to take anything up to two/three days. The huge storm is expected to make landfall at around 10PM to midnight tonight. It currently sits around 350 miles from the coastline and is moving towards the coast at around 20 MPH. It has a central pressure of 922 HectoPascals. This is the most recent advice modelling image for the Cyclone from 90 minutes ago. ABC News: Cyclone exodus gains sense of urgency. This article has related articles, video, and audio and those further links are below that main image there on the page. 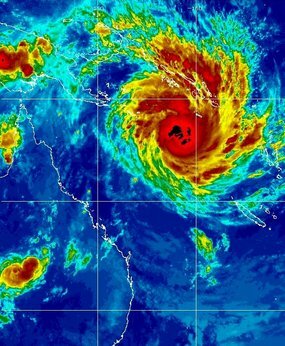 The Courier Mail: 30,000 evacuated from Cairns as a city braces for a pounding from Cyclone Yasi. At the bottom of this article is a video showing the State premier Anna Bligh at one of her many media updates. 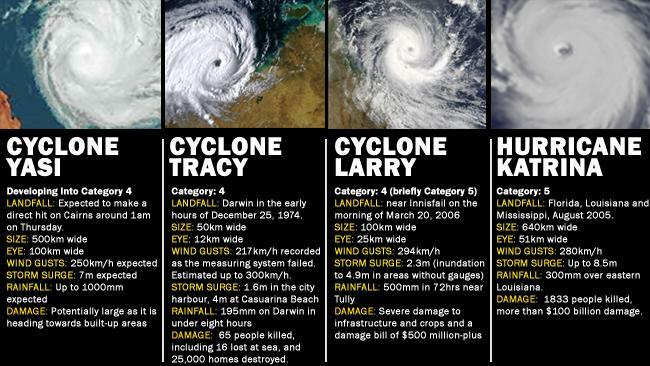 This following image shows a comparison between 4 major storms. The second image there is for Cyclone Tracy, a very small but highly intense Cyclone that struck central Darwin early in the morning of Christmas Day in 1974. This Cyclone destroyed the City. As is graphically seen by comparing this Cyclone Yasi, with Hurricane Katrina, the two systems are quite similar in size but look in the rainfall area where it shows Katrina brought with it a rain dump of around 300mm (about a foot) in Eastern Louisiana, Cyclone Yasi is expected to dump up to 1 metre of rain around 40 inches, and more than three times as much as Katrina. The two have similar huge storm surges, the amount of water over and above the normal height of the sea level, and in the case Of Cyclone Yasi, that surge is expected to be in the vicinity of 7 metres, or around 23 feet. Because of that predicted storm surge, low lying areas close to the waterfront have been evacuated. Both major hospitals in Cairns have been completely evacuated in a logistical operation using the Royal Australian Air Force, all patients being transferred South to Brisbane. People living in the area have been choking all roads leading out and to the South, and also West, further out into Queensland. Those electing to stay are making preparations for something on the scale never before seen in Australia. The Cyclone is now around 800 Km from landfall, and travelling at around 35KPH, and it is expected to make landfall at around 10PM on Wednesday night as a very severe Category 4 system. ABC News: Residents urged to flee monster cyclone. This article has related articles, video, and audio and those further links are below that main image there on the page. 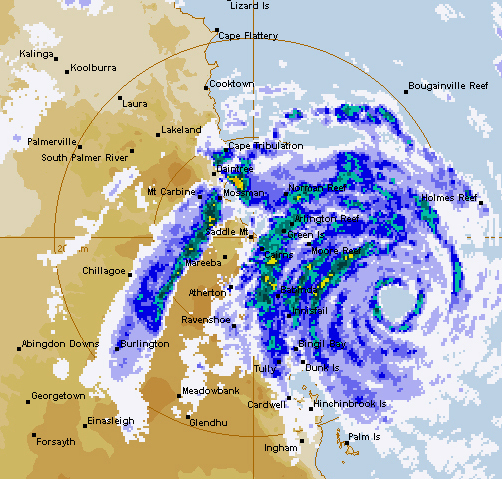 The Courier Mail: North Queensland evacuates, battens down for Cyclone Yasi. This article has a video as the cantral image here, and also a further image with details part way down the article. There is also audio of the State Premier Anna Bligh’s warning, and a further video near the bottom of the article. Recently, the State of Queensland in Australia has gone through a huge flood event that affected most of the State. Here in Rockhampton, where I live, the Fitzroy River that flows through the Centre of the city was in major flood, and has only just receded. After that, a major flood event moved into the South East Corner of the State and there was a major flood in the State Capital Brisbane. As we live in the Southern Hemisphere, the Seasons are the opposite to what they are in the Northern Hemisphere. It is Summer here now, and in the Northern parts of this vast Continent Australia, this is also the Cyclone Season. A Cyclone is what you in the U.S. call a Hurricane. The only difference, other than the name, is that here in the Southern Hemisphere, they rotate in the opposite direction, in our case, clockwise. The recent flooding event in our area, Rockhampton was caused by the rain associated with a Cyclone that made landfall to the North of here in the very early hours of Christmas morning. With Cyclones, the major rain event is to the South of the eye of the Cyclone, and the rain associated with this earlier Cyclone cause major flooding in the catchment of the Fitzroy River, and all the 8 rivers in this major River Basin were in major flood, the first time in recorded history that this has happened. Two days ago, a second Cyclone made landfall to the North of here, It was a small tight system and was a Category 2 system. It caused only minor damage and once it made landfall, it decayed rapidly into a Tropical Low Pressure system, losing its Cyclone Status, again bringing with it large dumps of rain. However, what is more frightening is that currently, out in the Coral Sea to the North East sits Tropical Cyclone Yasi. This is currently a massive system, as you can easily see from the image above. The State of Queensland is outlined at the left in white. This State is more than twice the size of Texas, so that gives you some idea of the size of this Cyclone. It is currently around 900 miles off the Coast and is tracking West at around 25 MPH. It is expected to make landfall sometime early on Thursday morning in an area between Cairns and Innisfail. This is around 600 miles from where I live here in Rockhampton. Even so, we are expected to be at the outer edge of the effects of this huge system. With the main rain event associated with any Cyclone falling to the South of the eye, we will be getting another huge rain dump into an area still recovering from the earlier major flooding event. The second image shows the projected track of the Cyclone. This is a system that rivals Hurricane Katrina in many respects, and the only difference here is that the impact area will be less populated. There will be a huge surge in the sea level that is associated with any tropical storm, and this is also expected to cause major problems. With respect to the rainfall associated with this huge system, some areas are expecting rainfall in the amount of 40 inches. As things progress, I will be updating this post. Thank you Tony for a really good post with lots of updates.